These baked salmon meatballs are a healthy and delicious meal! They’re gluten free, paleo, keto, whole30 and AIP. Salmon is one of those super foods that I always feel like I could work into my diet more! I love how it tastes, and I love how satiated and healthy it makes me feel when I eat it. Salmon is easy to cook, and versatile, yet I still always feel like I get stuck in a rut with salmon recipes. Yes, it’s easy to just bake salmon and have it with a side, but it’s always fun to mix it up, right? That’s where these salmon meatballs come in! 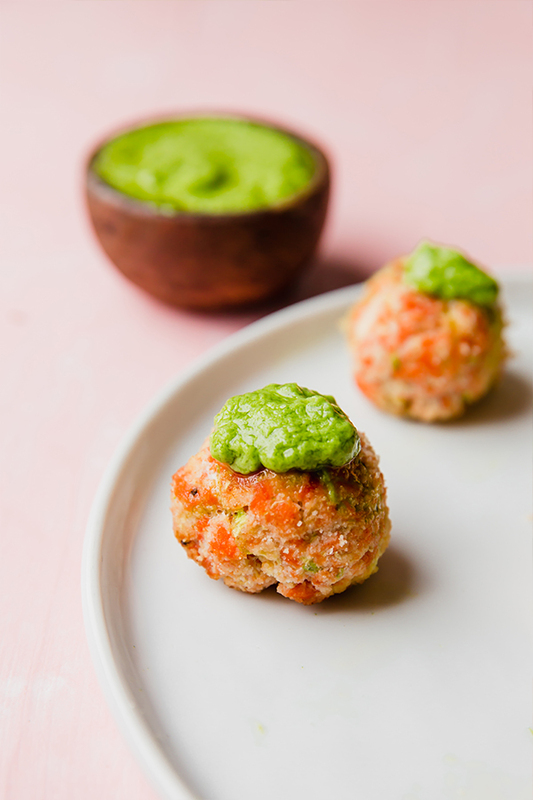 These baked salmon meatballs are healthy and delicious! Plus, these are made without any bread crumbs or eggs! They’re paleo, keto, whole30, and AIP, and they even feature hidden veggies and a flavorful sauce for dipping or topping. How can you eat these salmon meatballs? Enjoy them as a main dish with a vegetable side dish. 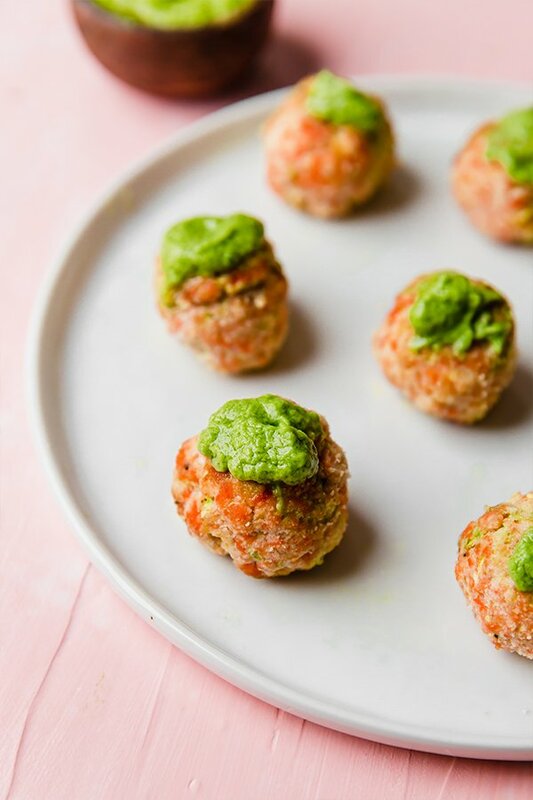 These salmon meatballs are super satiating and would be great with some zucchini noodles, or some roasted asparagus! Put out some fancy toothpicks and let your party guests much on these yummy, unique meatballs. I find sockeye and coho salmon to be the most accessible in grocery stores in my region personally, and they both work in this recipe. If there’s another variety of salmon that works better for you, that will work too! 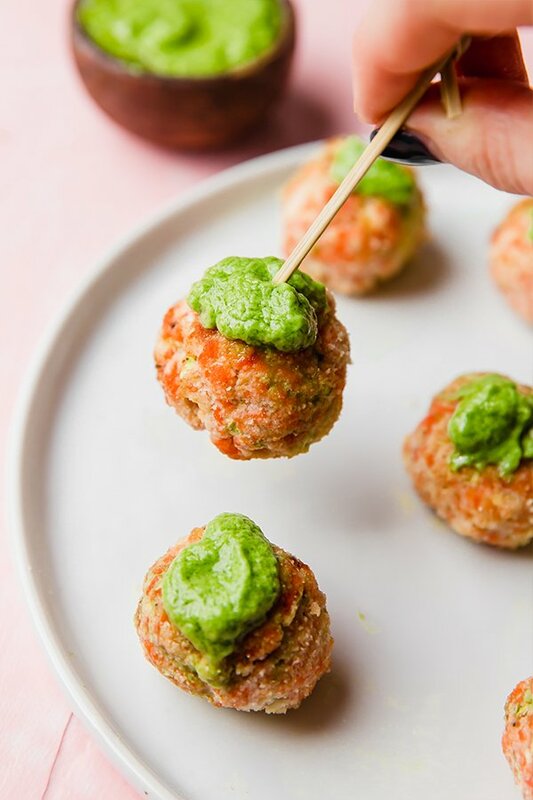 The zucchini acts as a bread crumb substitute to help bind these meatballs a bit while adding in another layer of nutrients with hidden veggies! Coconut flour helps bind the meatballs there are no eggs or breadcrumbs. I haven’t tried other flours. This helps to add more moisture and healthy fats! These are the ingredients that make the avocado green goddess. These baked salmon meatballs are a healthy and simple main dish! Using a food processor, chop the zucchini until fine. Use a cheesecloth or paper towel to squeeze out some of the excess moisture and set aside in a large bowl. Check the salmon for any pin bones and remove them. Using the same food processor, process the salmon until ground. Combine the salmon with the zucchini and mix in the remainder of the ingredients. Mix until thoroughly combined. Roll the salmon mixture into meatballs and place on the baking sheet. Bake in the preheated oven for 15-18 minutes or until baked through. Set aside. Prepare the green goddess by combining all of the ingredients in a high-speed blender until smooth. Serve the meatballs with the green goddess and enjoy! This sounds delicious! I don’t have a food processor – can you recommend one for me? Are you using fresh salmon or canned for this recipe? I have not used canned salmon in a long time, so I’m not even sure if it would be AIP compliant. Thanks! I use fresh salmon 🙂 It has a lot more moisture and flavor. Canned salmon would be AIP, but I’m not sure it would work in this recipe.